The Alerts Interface exposes directives and events that are used to set, manage and cancel timers, alarms, and reminders. Your client must implement the logic necessary to manage timers, alarms, and reminders if internet connectivity is lost or if the on-product clock is out of sync with NTP. Please reference the Alerts Overview and the Interaction Model for additional implementation details. The Alerts interface has been enhanced to allow the deletion of multiple alerts via the DeleteAlerts directive, DeleteAlertsFailed event, and DeleteAlertsSucceeded event. SetVolume and AdjustVolume directives, and the VolumeChanged event have been added to the Alerts interface. The addition of these directives and events enable the end user to control alert volume via the Amazon Alexa app. Users can select custom alert tones within the Amazon Alexa app. See AVS UX Attention System for guidance on how to manage alerts, including custom alerts, for your product. The following diagram illustrates state changes driven by the Alerts component. Boxes represent Alerts states and connectors indicate transitions. IDLE: Prior to a previously set alert going off, the Alerts component should be in the idle state. Alerts should also return to an idle state once an alert is stopped/finished. This can occur as the result of user speech, a physical button press, or GUI affordance. FOREGROUND ALERT: Assuming an on-client alert has already been set, Alerts should transition from the idle state to the alert foreground state when an alert starts and the AlertStarted event is sent to the Alexa Voice Service. This is only true if the Alerts channel is in the foreground, which implies the Dialog channel is inactive. For more information on channels and channel prioritization, please see Interaction Model. When an alert is stopped via speech, button press, or GUI affordance, the Alerts component should transition from the alert foreground state to the idle state. 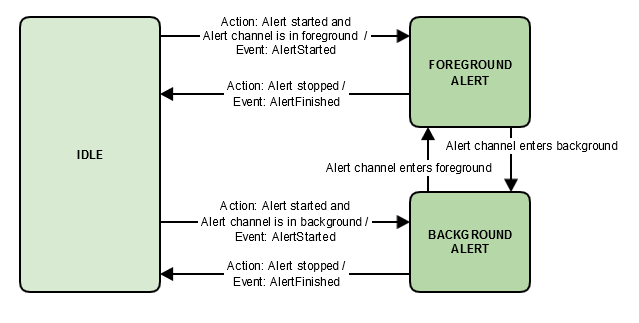 If the Dialog channel becomes active while an alert is going off, your Alerts component should transition from the foreground alert state to the background alert state as long as the Dialog channel is active. When the Dialog channel becomes inactive, it should return to the foreground alert state until it is stopped/finished. BACKGROUND ALERT: The Alerts component should only transition to the background alert state when the Dialog channel is active. For more information on channels and channel prioritization see Interaction Model. To use version 1.3 of the Alerts interface, it must be declared in your call to the Capabilities API. For additional details, see Capabilities API. Tip: The sum of maximumAlerts.alarms and maximumAlerts.timers cannot exceed the value provided for maximumAlerts.overall. For example, you can declare that maximumAlerts.overall == 10, and that maximumAlerts.alarms and maximumAlerts.timers each == 8; if 8 alarms are set, you can only set 2 timers. Alexa expects a client to report the status of all locally stored alerts with each event that requires context. Alerts are organized into two lists: allAlerts and activeAlerts. allAlerts is a complete list of locally stored alerts. activeAlerts is a list of alerts currently in focus or sounding for an end user. allAlerts.type Identifies the alert type. activeAlerts.type Identifies the alert type. If loopCount is absent from the payload, the alert must sound for one hour or until it is stopped by the user (voice request or physical affordance). Cloud provided assets take precedence over locally stored audio files. If assets are provided they must be played for the user in the order provided in the assetPlayOrder list. Otherwise, use the audio files for alerts provided by Amazon. Important: If the assets.url[i] is unreachable, or if your client fails to download the associated files, it should play the audio files for the associated alert type provided by Amazon and adhere to the provided loopCount and loopPauseInMilliSeconds. The SetAlertSucceeded event must be sent to AVS after receiving a SetAlert directive, when the client successfully sets the alert. The SetAlertFailed event must be sent to AVS after receiving a SetAlert directive, when the client fails to sets an alert. This directive is sent from AVS instructing your client to delete an existing alert. Your client may receive the DeleteAlert directive as a result of a speech request to cancel/delete a timer, alarm, or reminder, or when a previously set alert is deleted using the Amazon Alexa app. The DeleteAlertSucceeded event must be sent to AVS after receiving a DeleteAlert directive, when the client successfully deletes or cancels an existing alert. Note: For more information on when to send the DeleteAlertSucceeded event, please see Alerts Overview. The DeleteAlertFailed event must be sent to AVS after receiving a DeleteAlert directive, when the client fails to delete or cancel an existing alert. Note: For more information on when to send the DeleteAlertFailed event, please see Alerts Overview. This directive instructs your client to delete all existing alerts on a product. Each alert is identified by a unique token within the payload. Your client may receive the DeleteAlerts directive as a result of a speech request to cancel/delete all alerts. If one or more alerts fail to be deleted, the client must rollback and send a DeleteAlertsFailed event to Alexa. Alexa will then retry until all alerts are deleted, at which point a DeleteAlertsSucceeded event must be sent by your client. Note: If one or more alert tokens are not found on the product, the client should proceed with deleting all matching tokens. In this case, this process would not fail. DeleteAlerts should be sent only if one or more existing alert tokens on the product fail to be deleted. The DeleteAlertsSucceeded event must be sent to AVS after receiving a DeleteAlerts directive, when the client successfully deletes or cancels all existing alerts within the tokens array. Note: For more information on when to send the DeleteAlertsSucceeded event, please see Alerts Overview. The DeleteAlertsFailed event must be sent to AVS after receiving a DeleteAlerts directive, when the client fails to delete or cancel at least one of the existing alerts within the tokens array. Note: For more information on when to send the DeleteAlertsFailed event, please see Alerts Overview. The AlertStarted event must be sent to AVS when an alert is triggered at its scheduled time. A DeleteAlert directive is received. After sending an AlertStopped event, your client must inform AVS if the alert was successfully deleted with either a DeleteAlertSucceeded event or DeleteAlertFailed event. This interaction is illustrated in Alerts Overview. A physical control (hardware button or GUI) is used to stop the alert. The loopCount is complete, or an alert without a loopCount has played for an hour and is stopped locally. Note: For more information on when to send the StopAlert event, please see Alerts Overview. The AlertEnteredForeground event must be sent from your client to AVS when an active alert enters the foreground (plays at full volume) or re-enters the foreground after a concurrent interaction on the Dialog channel finishes. For specific details on channel interaction, see Interaction Model. The AlertEnteredBackground event must be sent from your client to AVS when an active alert exits the foreground (attenuates or pauses) while a concurrent interaction on the Dialog channel is occurring. For specific details on channel interaction, see Interaction Model. This directive instructs a client to set the absolute volume level for an alert. This directive instructs a client to adjust the relative volume level of an alert. volume The relative volume adjustment. A positive or negative long value that is used to increase or decrease volume in relation to the current volume setting. This event must be sent to AVS after receiving either a SetVolume or AdjustVolume directive. volume This is the volume that is locally adjusted on your product. Accepted values: Volume must be a value between 0 (min) and 100 (max), inclusive. Warning: This is not the current version of the Alerts interface, some features may not be supported. If this isn't what you're looking for, please use the Interface Version Selector to navigate to the correct version. The payload of the SetAlert directive has been updated to support named timers and reminders. This change is backward compatible. To use version 1.1 of the Alerts interface, it must be declared in your call to the Capabilities API. For additional details, see Capabilities API. The Alerts Interface exposes directives and events that are used to set, manage and cancel timers, alarms. Your client must implement the logic necessary to manage timers, alarms if internet connectivity is lost or if the on-product clock is out of sync with NTP. Please reference the Alerts Overview and the Interaction Model for additional implementation details. To use version 1.0 of the Alerts interface, it must be declared in your call to the Capabilities API. For additional details, see Capabilities API. This directive instructs your client to set a timer or alarm for a specific duration or time. Your client may receive the SetAlert directive as a result of a speech request to set an alert, or when a previously set alert is re-enabled using the Amazon Alexa app. This directive is sent from AVS instructing your client to delete an existing alert. Your client may receive the DeleteAlert directive as a result of a speech request to cancel/delete a timer or alarm or when a previously set alert is deleted using the Amazon Alexa app.